Berkey Water Filter Review | Is It A Scam? In my opinion, the Berkey Water Filter has it’s own benefits in portability as well as quality. However, slower flow rate and constant cleaning are not very pleasant. It is RECOMMENDED if you are renting a place which was unable to install a water filter. The Berkey is definitely better than a water pitcher. Berkey is a small company which mainly produce portable indoor water filters for home, offices and outdoor activities. There have been questions surrounding Berkey on its indoor water filters because they are banned in California and Iowa. Berkey is a portable water filter that can be easily moved around the house. The filtration is performed inside the stainless steel container itself once you fill it up with tap water. It uses gravity to force the water to pass through the filtration cartridge which will be stored in the storage tank. 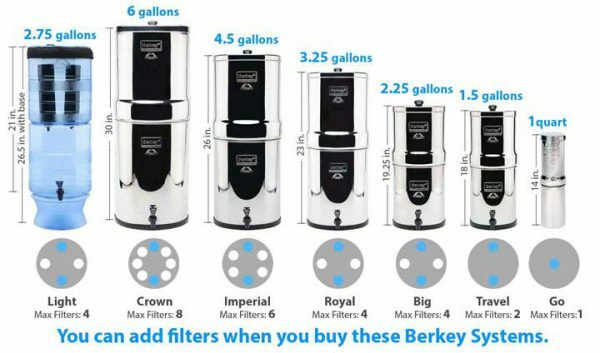 Capacity and Size: Berkey water filter comes in different size and capacity. They cater for all use case ranging from hiking or camping to small offices usage. In general, the concept and functionality of all models are the same. The larger the system, more cartridges can be inserted to speed up the filtration process. Crown Berkey can handle up to a maximum of 8 cartridges at once. State of The Art Filter: Berkey claims that it’s filter has exceeded the NSF/ANSI Standard 53. Their Black Berkey filter is has been tested in an EPA-approved laboratory. The result came with a long list of water contaminants that were filtered by Black Berkey. Berkey claims that it is the longest list ever been seen in the industry. It raised the standard of filtration in the water filter industry. Traditionally, the pathogen is only capable of being removed by UV light. The Black Berkey is able to remove it without using a UV light in the system. No Tubing and Portable:All Berkey water filters are gravity-fed filters which don’t require any connection to pipes. With that, no tubing is attached to the system and it can literally be anywhere in the house. It free up the space near the sink where conventional countertop water filters are located. The main filter for all Berkey systems is the Black Berkey filter. Black Berkey: It is a microporous filter, which contains pores that are less than 2nm in diameter. It is a cleanable purifier element which filters off bacteria such as pathogen and virus in the water. PF2 Fluoride Filter: This filter mainly absorbs fluoride, arsenic and some of the heavy metal ions in the water. We rated this system as one of the great water filters that remove fluoride. Berkey claims that it is capable of the filter up to 99% of the top 20 contaminants shown below. Before the installation, rinse your Black Berkey filters for 20 seconds on the tap as a start. Since there is no involvement in drilling and connection from the pipe, you just need to screw on the two Black Berkey with an optional of PF2/PF4 fluoride filters on your Berkey. You can refer to the setup video below on the installation process. Each Berkey comes with 6 months limited warranty on manufacturer defects. However, if you register when you first purchase your Berkey (limited to Travel, Royal, Big, Imperial, and Crown only), you will be eligible for Berkey Care Lifetime Warranty. Besides, the Black Berkey filter comes with 2 years prorated warranty on manufacturer defects in 6 months interval. Frequent Cleaning: One of the main customer complaints is frequent cleaning required for the Black Berkey. This is due to it affects the flow rate of the system. Berkey is a gravity-fed filter, the flow rate is slower compared to pressure led filter. It is suggested that you fill up your Berkey when it is empty, not when you are thirsty. Although it is portable, sometimes the Berkey can be a bit bulky which took up a lot of space. The state of California requires all indoor water filter to pass through the independent third-party agency test, such as NSF before it is eligible to sell in the state. Although Berkey complied with the request of obtaining the NSF Standard 42 and 52, the state requested high cost in maintaining the certification in the state of California. After a thorough consideration, Berkey decided to withdraw from selling in the state of California. 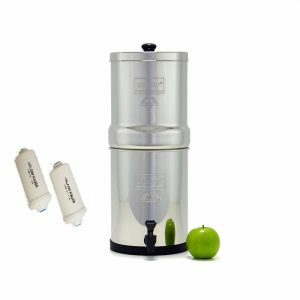 Go Berkey Kit – 0.25 Gallon Stainless Steel Water Filter with Sports Bottle. 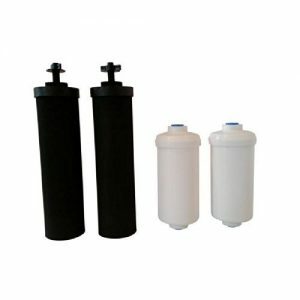 Filter replacement such as Black Berkey, PF-2, and PF-4. Replacement parts for all products. Verdict: In my opinion, Berkey is not a scam. It is just the rules and regulatory issue that prevents it from selling in two of the states. You can visit their website for the full lab certification. Filtration Quality: Their quality cartridge, Black Berkey is capable of removing the top 20 major contaminants of up to 99%. Furthermore, its filter is capable of removing pathogenic bacteria without using a UV sterilizer. Portability: It is extremely portability like a water pitcher which can easily move around after you have filled up the storage tank. Reasonable Annual Maintenance: Consider the capability of removing contaminants, the replacement cost is relatively reasonable for such a great system. Lifetime Warranty: It comes with a lifetime warranty on the Berkey system against manufacturing defects and 2 years on the Black Berkey Filter. Click on the button to get the latest discount and find out what the happy customers say about this pitcher. Have you ever wonder whether your city is affected by water fluoridation? Search for your country/state in the Extent of Water Fluoridation Guide. If you can’t purchase this product due to the ban restriction, allow me to recommend you some of other great countertop water filter in town. No complicated installation is required. Check out our best countertop water filter guide today! Still having doubts about this system? Leave us a comment below with your question and we will get back to you at our earliest. One thing. The company refuses to disclose where the filters are manufactured. Upon question, they say “made in USA”, but they won’t say WHERE. I find this strange. I bought a berkey water filter in april. In the beginning it was fine but now the taste of the water is as if it comes from a fungus cellar. I have cleaned it took the whote filters out but the taste keeps coming back. Hi, I’m sorry to hear that. I think the filter cartridge must be a faulty piece. Have you tried to contact Berkey regarding this matter? You can reach to them via email customerservice@berkeyfilters.com or toll free helpline 1-800-350-4170. Pretty cheap components. The stock spigot is probably made of the same inferior plastic composition as the knob on the lid, which in my case, snapped right off. We bought a Berkey with high hopes. After only 1.5 months of use we had the water tested and it came back OVERGROWN with coliform!! Even after the manufacturer protocol of flushing and cleaning the water came back with coliform contamination. Our source water is clean. Somewhere in the system there is a contamination. After alerting the dealer BerkeyWaterFilterStoreCanada.ca they simply stated that because we had our unit longer than the warranty they weren’t going to do anything for us. I will NEVER buy or recommend Berkey to anyone ever. They chose to ignore the health risk that their unit posed to our family for a measly 300$! Apparently the health of my children and their reputation isn’t worth it. Shame on Berkey and shame on their dealers!! I’m sorry to heard that you are having this problem. Sometimes it might be due to faulty filter cartridge. Have you tried to replace a new set of the Berkey filter?